The U.S. will have over 1 million job openings in STEM-related fields by 2018; yet, according to the U.S. Bureau of Statistics, only 16% of U.S. bachelor’s degrees will specialize in STEM. Our economy and national security is depending on more STEM graduates. Professionals in STEM fields report both high earnings and high satisfaction in their careers. 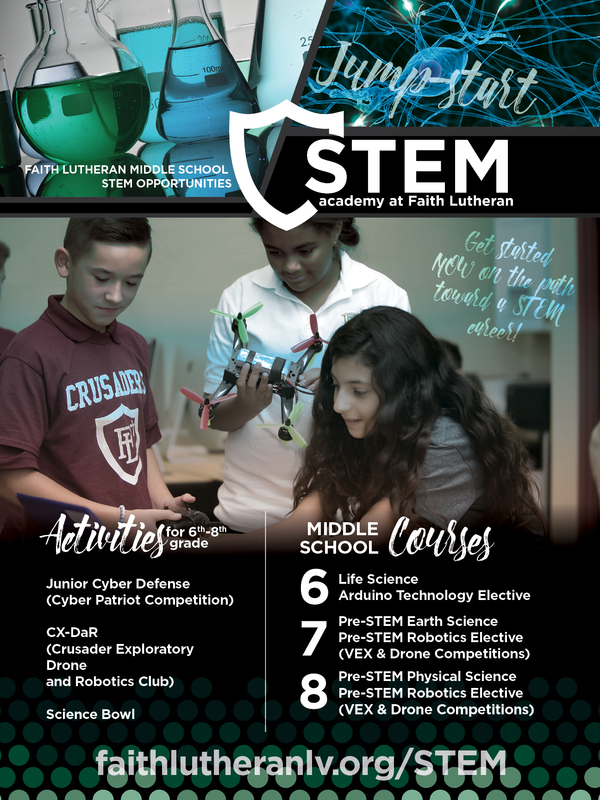 Faith Lutheran Middle School & High School is positioned both geographically and scholastically to be a leader in STEM education. Our mission is to IGNITE, EXCITE, and PREPARE our finest math, science, and technology students for STEM majors in our nation’s top universities. At the core of Faith Lutheran’s STEM Academy is the Internship Program. We are partnered with UNLV, NV Energy, local engineering firms, tech companies, medical facilities, and environmental agencies that provide our students with hands-on experience and research in their chosen field. Current course offerings in Math and Science are supplemented with STEM course offerings in the Engineering, Biomedical, Computer Science, and Environmental fields. The STEM program includes field trips, guest speakers, authentic workforce research, product development, and student presentations. Faith Lutheran High School offers a STEM Endorsement that is added to a student’s transcript upon completion. This STEM Endorsement will announce to universities that the student has accomplished a well-rounded, rigorous program in the areas of math and science. Additionally, this STEM Endorsement will indicate that the student has become proficient in a collaborative scientific environment and has accomplished significant research in science, technology, engineering or math fields. Over 60% of Faith Lutheran graduates with career 4.0 declare a STEM major. In addition to completing research or an internship in the engineering field, in the Engineering - Honors course, students will explore the world of robotics, one of the fastest growing technologies in our society. Students will gain skills and knowledge in mechanics, structure assembly, software programming, sensor electronics, motors, and gear ratios. Work in this class will develop skills related to Faith Lutheran’s participation in a nationally recognized robotics competition in March. Upon completion of the robotics competition, students will explore topics ranging from rocketry to ballistics to civil engineering. In addition to completing research or an internship in the biomedical field, students will complete the Molecular Genetics - Honors course, which serves as an extension of advanced Biology courses, aimed to teach Genetics and Molecular Biology in greater depth. This course will engage top biology students in lab-based collaborative work with state-of-the-art equipment and techniques. Students develop skills leading to their participation in the Bio Engineering High School (BioEHS) competition held annually at UC Berkeley. Research topics include DNA structure and modification, PCR and its applications, proteins and protein gels, cloning and explorer series, RNAi interference, and independent projects. In addition to completing an internship in the architecture field, in the Architecture - Honors course, students will learn the principles and elements of design. Students will gain skills and knowledge in sketching and hand-rendering techniques, computer-aided design (CAD) and building information modeling (BIM), the concept and construction of buildings as well as their impact on the natural environment. Work in this class will develop skills related to Faith Lutheran’s participation in an AIA design competition. In addition to completing an internship in environmental science, students will complete advanced coursework in the discipline. This interdisciplinary study incorporates physical and biological sciences in the study of earth’s systems and resources, energy conversions, human impact and global changes. Additionally, in our very own cutting edge Research Greenhouse, students will engineer solutions to real-world situations through plant propagation, grafting, hydroponics, aquaponics, biochemistry, logistics and maximizing production. In addition to completing a computing internship, students will become proficient on programming in Java, Xcode and Swift, using algorithms, data structures, design strategies, and algorithms to solve problems and create meaningful computational artifacts. Students will be prepared for future work with programming as applied to cybersecurity, counterterrorism, social networks, healthcare, marketing and economics. Throughout their coursework, students will participate in competitions and produce authentic products, such as developing apps or producing websites. The General STEM Endorsement is designed for students interested in a blend of different STEM fields. Students are able to take advanced courses in biology, chemistry and physics. In addition to completing research or an internship in a STEM field of their interest, students will complete the Molecular Genetics -Honors, Engineering - Honors, or STEM Research - Honors course.